Oak has been a staple of British buildings form many hundreds of years and there’s a very good reason why. This beautiful, durable and very British Wood really lasts the distance and often looks as great as the day it was carved several decades later. 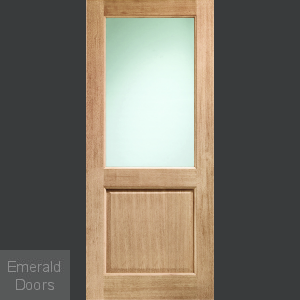 If you’re looking to add a touch of class to your home or place of business then make sure you give your building’s exterior the ultimate curb appeal with oak external doors from Emerald. 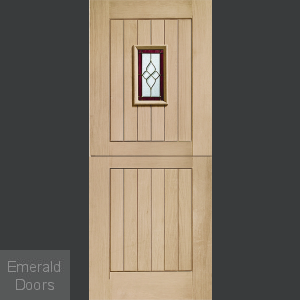 At Emerald, we pride ourselves on providing the complete package to our customers which is why you’ll find a huge range of matching external and internal oak doors that are ideal for adding the finishing touches to your décor and providing that all important and aesthetically pleasing air of quality within your premises. 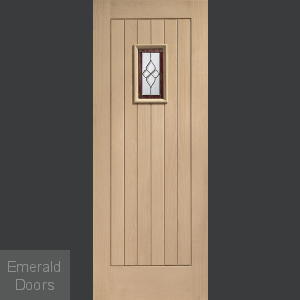 Our doors are designed to meet British standards and are built to last, so once you’ve made a purchase you can rest assured you won’t be choosing doors again in a hurry! Call now on 0845 62 50 755, impartial advice about your external door options or email [email protected] for more information. All our external oak doors are constructed from solid timber which is then veneered to provide maximum stability and durability. Our lovingly manufactured doors are extensively tested to guarantee longevity, so once your door is installed, you can sit back and enjoy it, without worrying about distress or damage. So click on your favourite door and use our shopping cart to purchase your oak external doors today.